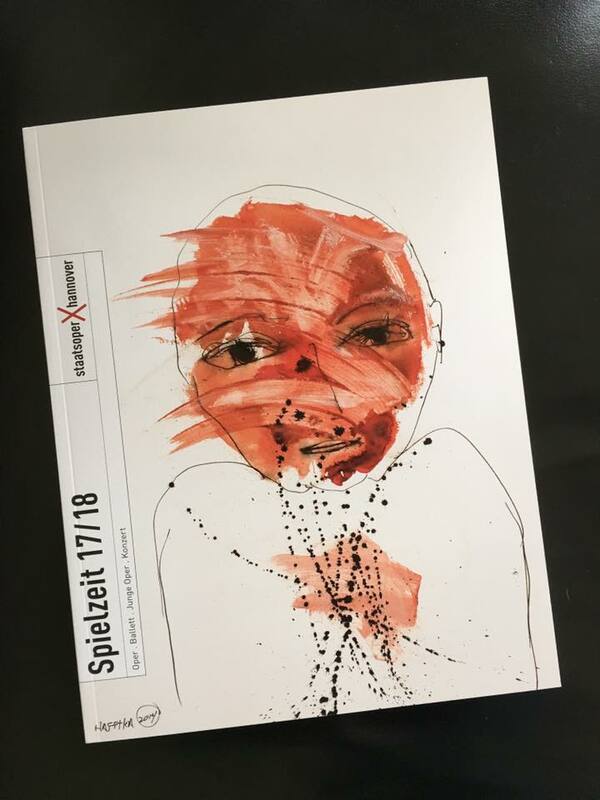 Hafftka's works are featured in the 2017-2018 annual brochure of the opera house Staatsoper Hannover, Germany. To view the whole brochure click here. Susan Sarandon in front of her favorite painting by Hafftka on the opening night. "The Promised Land", 1998, oil on canvas, 78 x 62 inches, is in the collection of Mr. Angel Gurría the Secretary-General of the OECD, The Organisation for Economic Co-operation and Development. 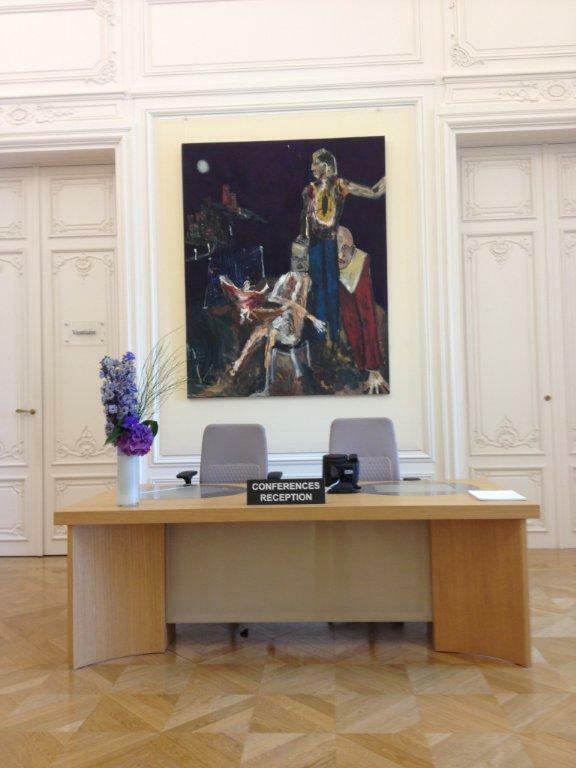 The painting is hanging in the main reception hall of OECD's headquarters, the Chateau de la Muette, Paris, France. I attached a pic of it in situ. An article on "The Selecting Hand", an appropriate point of departure for reflecting on whether we learn from the history of the Holocaust, a topic Caludia Moscovici, author and critic, leads into after discussing the painting. Yareah Magazin published an article about the portraits of Poets Hafftka painted in the past few years. This article displays great paintings along side poems by the great poets, Phillip Levine, US Poet Laureate 2011, among them. See the article on the Yareah website. 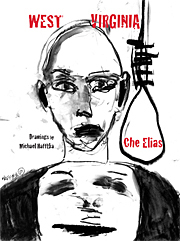 February 2013 Isabel Del Rio wrote " Winner , by the Artist Michael Hafftka" in Yareah Magazine. Clockwise from top left: Hafftka & curator Nussear at the opening reception; Toast at the opening; Collectors and friends meet the artist; Ian Colletti serving drinks; Yonat and Micael Hafftka with Dr. Larry Schneck. "Wraithworld", a show of recent paintings at Vaudevill Park, Brooklyn, NY, curated by Ian M. Colletti, Lisa Di Donato and Caleb Nussear. The closing of the show was celebrated with a musical perfromance by Michael Hafftka on fretless guitar and Johnny Reinhard on bassoon. "Yellow Back Radio Break Down" performed by Michael Hafftka on guitar and Jemeel Moondoc on alto sax at Spectrum in Manhattan, NY. "Mythological Chaos" performed by Michael Hafftka on fretless guitar and Valerie Kuehne on chello at Spectrum in Manhattan, NY. The records is now available at Amazon. "Freedom Sweet" was recorded live at WKCR 89.9FM NY studios and was broadcasted on the "Afternoon New Music" program. Michael Hafftka on fretless guitar and Valerie Kuehne on cello recorded for WKCR as a prelude to their performance at Spectrum, NY, NY, on September 6th. Michael Hafftka joined enigmatic and reclusive outsider musician Sterling Smith of Jandek and played two sets in his only performance in NY in years. On March 23, 2012 Hafftka on lead guitar and March 26,2012 Hafftka on bass and marimba. Spin magazine proclaimed Jandek as one of "the ten most interesting musicians of the 1980s." Kurt Cobain famously remarked, "He's not pretentious, but only pretentious people like his music," and a tribute album, Naked In the Afternoon, was released in 2000 boasting renderings by Low, Thurston Moore and Bright Eyes. Michael Hafftka and the poet and art historian David Shapiro after lunch in Manhattan. A show of an Alef Bet set by Hafftak at the Leatherby Libraries at Chapman University, Orange, CA. The set is part of the Chapman University's Phyllis and Ross Escalette Permanent Collection of Art. Michael Hafftka painting the Grammy Award Winner Miri Ben-Ari. The portrait is the latest addition to a series of portraits of musicians. Hafftka started painting musicians in the late 70's when he frequented avant guarde jazz clubs on the lower east site. His portrait of Butch Morris is in the collection of the San Francisco Museum of Art. Last year he painted John Zorn, see September 2011 below. Ira Sadoff, an American poet, the recipient of fellowships from the National Endowment for the Arts and the John Simon Guggenheim Memorial Foundation, sat for a portrait at the Hafftka studio. October 2011 Norbert Oldani composed and created music for the painting Husband and Wife (78x62 inches oil on canvas, 1992). "A setting via Kyma X and a DX&E! of Michael Hafftka's photo of his painting Husband and Wife. Blue means spirit - in this case a unity with a duality within. The music is a simple 2 voice convergence canon with accompaniment and a seamless variation gave a unified two part AB form. Perhaps if Michael had made another painting like this one the man would be sitting down and the woman would be standing up. Yes vs. No, + vs. -, etc. This is in 26 tone EDO with a touch of one of it's modes, the Erlich Double Diatonic." "To create a music which is instrumentally expressive and which uses mainly electronic instrumental technology and which is also based on contemporary acoustical knowledge and mathematics." Collaboration between Michael Hafftka and Cecelia Chapman. Video by Cecelia Chapman, Music by Feeding Goats (Michael Hafftka & Yonat Hafftka). Cecelia Chapman is an artist and filmmaker; her work investigates image, perception, and belief, creating works that attempt to examine human connection in the universe. A blast from the past. Just added Portrait of Cathleen to the Early Years section. Click on the image to enlarge. John Zorn, avant-garde composer and musician, posing for a portrait at Hafftka's studio. The poet Irena Klepfisz sat for a portrait at the Brooklyn studio. The poet Gerald Stern sat for a portrait at the Hafftka's studio. 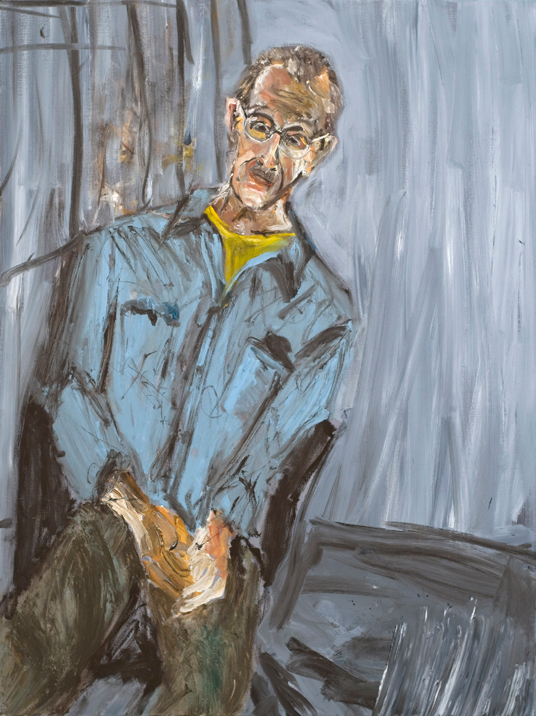 Three month before The Library of Congress announced their selection of Phillip Levine as the next poet laureate of the United State, succeeding W. S. Merwin, Phil sat for his protrait at the Brooklyn Studio of Michael Hafftka. Michael Hafftka painted a portrait of the poet and writer Rodger Kamenetz, what turned out to be the beginning of a series of portraits of poets and other artists. 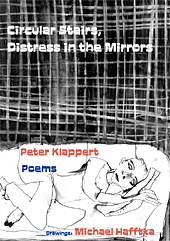 Hafftka and Kamenetz are collaborating on a book of poems by Kamenetz with drawings by Hafftka. Teetering on the Edge of Creation: Painting the Zohar, an article by Laura Beckman, July 7, 2011, in Tikkun Daily, about Hafftka's recent work. 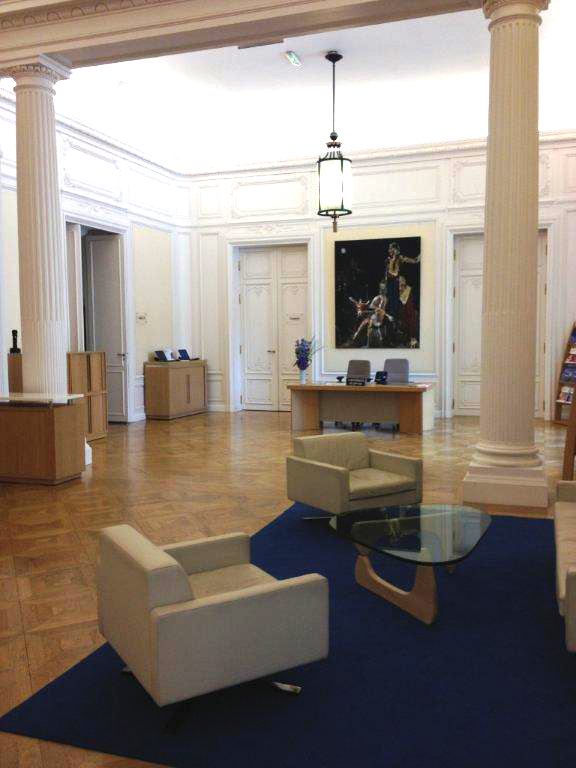 A selection of paintings is featurred in the Tikkun Gallery of the same issue. Randy Esada, a Los Angeles art dealer, has recently purchased 22 large oil paintings of my early work from the Robin Symes collection. London’s best-known and most successful dealer in antiquities in the 80’s, Robin Symes, and his partner Christo Michaelides had the largest collection of my early work of any private or public collection. The paintings have never been in any of my shows since my selling them to Robin and Christo in the 1980’s. The paintings hung at the Rockefeller Guesthouse on 52nd Street, a building designed by Philip C. Johnson in 1948,which at that time was owned by Robin and Christo. I have not seen theses paintings for many years, nor did I know where they were since Robin Symes sold the Rockefeller Guesthouse to Ronald S. Lauder in 1989. Robin Symes’ rise and fall are described in the publication by Peter Watson and Cecelia Todeschini entitled The Medici Conspiracy: The Illicit Journey of Looted Antiquities--From Italy's Tomb Raiders to the World's Greatest Museums (2006) and in an online article by Peter Watson The fall of Robin Symes.Robin Symes’ misfortunes intensified dramatically when Christo Michaelides, his life long partner, died in a freak accident in 1999. Robin alienated the family of his late partner, son and heir of the Papadimitriou shipping family, and they spent millions on proving legal claim to half of the Robin Symes’ assets. Dimitri Papadimitriou, the head of the family, won the legal battle. This loss pushed Symes into bankruptcy that resulted in his conviction and incarceration in January 2005. Lori Cole is a PhD candidate in the Department of Comparative Literature at New York University. Her research focuses on the artistic exchange between the European and Latin American avant-garde. She is also a translator and art critic, writing for Artforum.com and Flash Art, among other publications. Four works from the show. A solo show of paintings based on the new translation of the Zohar by Daniel Matt, The Zohar: Pritzker Edition, at the Mizel Art and Culture Center (MACC). This exhibition features a group of paintings that evolved from deep engagement with the Zohar, a collection of texts widely considered to be the most important work of Kabbalah. The exhibit opens two weeks after the close of a major show at Yeshiva University Museum, New York, in which a different selection from the Zohar works was on display. The Zohar series is a work in progress that began in 2008. Click here to see the completed works. Click here for the artist's statement. H. Romare Bearden 1928, Alfred Leslie 1945, Barnett Newman 1923, Richard Avedon 1941, Aaron Siskind 1921, Will Eisner 1936 (The Spirit Creator), Bob Kane 1934 (Batman Creator), Stan Lee 1939 (Spiderman, Hulk Creator), Alvin Schwartz 1934 (Superman, Batman), Roy Neuberger 1921, Alan Kaufman 1971, and James Baldwin 1942. A major show of recent work at Yeshiva University Museum (YUM), 15 West 16th Street, New York, NY, March 22-August 30. The show includes a major large painting from 1985 called The Hill (Jerusalem), which is in the permanent collection of YUM. Also included in the show are 22 watercolors of the Hebrew alphabet, Aleph-Bet, and a selection of 22 watercolors from a work in progress based on the new translation of the Zohar, The Zohar: Pritzker Edition, by Daniel C. Matt, which is being published by Stanford University Press. In addition to the large painting in the museum's collection and the watercolors, the exhibit includes a few of Hafftka's most recent paintings from 2007 and 2008. This show is the first major solo show of Michael Hafftka in New York City since his show at the Aberbach Fine Art gallery in the late 90's and 4 years since his retrospective of large oil paintings at the Housatonic Museum in Bridgeport, Ct.
A solo show of Hafftka at the Mizel Center for Arts and Culture November 2009 to January 2010. Wait, 60"x40" oil on canvas, 2006, was added to the permanent collection of Central High School, Philadelphia, PA, and is on permanent display. The Yeshiva University Museum acquired “The Hill (Jerusalem)", a major 1985 painting, for their permanent collection. The painting had been previously exhibited at the Jewish Museum in NY in the 1986 show Jewish Themes and was reproduced in their catalogue with the following text written by the curator of the Jewish Museum, Susan Tumarkin Goodman: "In The Hill (Jerusalem) Michael Hafftka has created a turbulent work inspired by the words of Ezekiel. As the son of Holocaust survivors, the artist found a contemporary metaphoric resonance in this passage that expresses God’s anger towards those who have fallen into the sin of idol worship. The various divine punishments are vividly expressed by Hafftka through energetic brush strokes and gestural surfaces that inform his multilayered and complex biblical interpretation with emotional fervor. In this scene of intense drama, with its tormented frenzied figures, Hafftka evokes the power of divine wrath with a raw intensity that is both disturbing and stimulating." The painting measures 78 inches high and 224 inches wide. 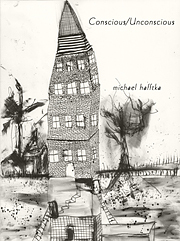 fiction by Michael Hafftka with 27 drawings. 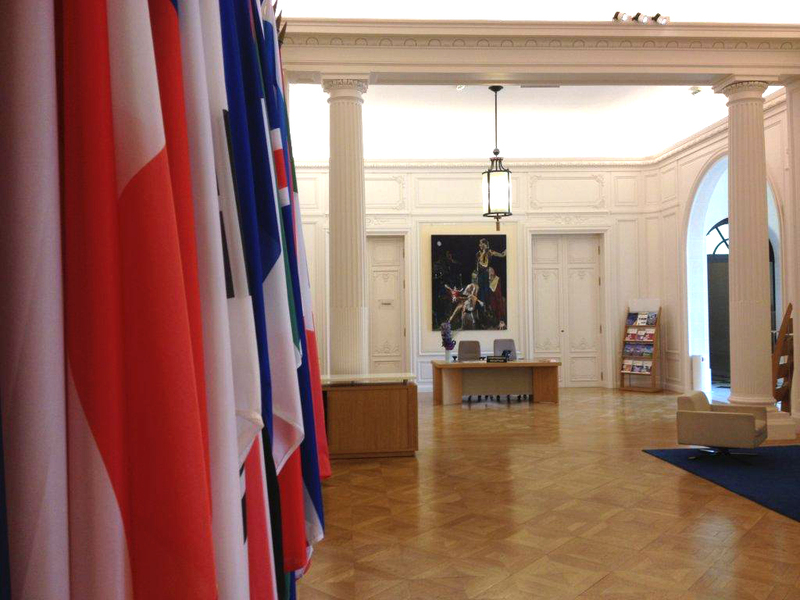 Three large paintings are included in a show at the Musee des Beaux-Arts d'Ixelles. The show opens October 18, 2006 untilJanuary 10, 2007 and will travel to Arizona State University Art Museum in March 2007. Published by Fugue State Press: Stet by James Chapman, book cover by Michael Hafftka. The ASU Art Museum, part of the Herberger College of Fine Arts at Arizona State University, has just received a gift of two encaustic paintings by Hafftka from the collector Stephane Jansen, a resident of Arizona. The ASU, named "the single most impressive venue for contemporary art in Arizona" by Art in America magazine, now has a total of three encaustic paintings by Hafftka. The National Gallery of Art, Washington, DC, aquires a 1985 set of etchings by Hafftka named Overtones. To view the set click here. Art New England Review by Steve Starger of "Michael Hafftka, A Retrospective: Large Oils 1985-2003" at the Housatonic Museum of Art. Arizona State Univeristy Art Museum located in Tempe, AZ, has recently aquired through a generous donation from Stephane Janssen of Scottsdale, a painting by Michael Hafftka called "Fat Man". The painting is one of six encaustic panels created by the artist in 1988. The Carnegie Museum of Art acquired this month a portrait of John Caldwell by the artist Michael Hafftka. 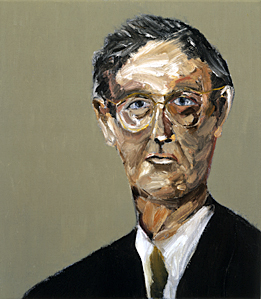 John Caldwell (1941-1993) served as the Curator of Contemporary Art at the Carnegie from 1983 to 1989. Richard Armstrong, the Director at the Carnegie Museum, knew and worked with John Caldwell and thus can appreciate the significance of the portrait to the history of the museum. As a Curator at the Whitney Museum of American Art for more than a decade during the eighties, Mr. Armstrong also knows the work of Michael Hafftka and has followed his career over the years. Caldwell discovered Hafftka’s work shortly before joining the Carnegie. Several years later under Caldwell’s directive, the Carnegie bought a large painting by Hafftka for the Museum’s permanent collection. Caldwell wrote extensively about Hafftka’s work and a friendship between the two ensued. The painting was purchased from Michael Hafftka in Brooklyn by Ms. Laura Hoptman, Curator of Contemporary Art, under the directive of Mr. Armstrong.